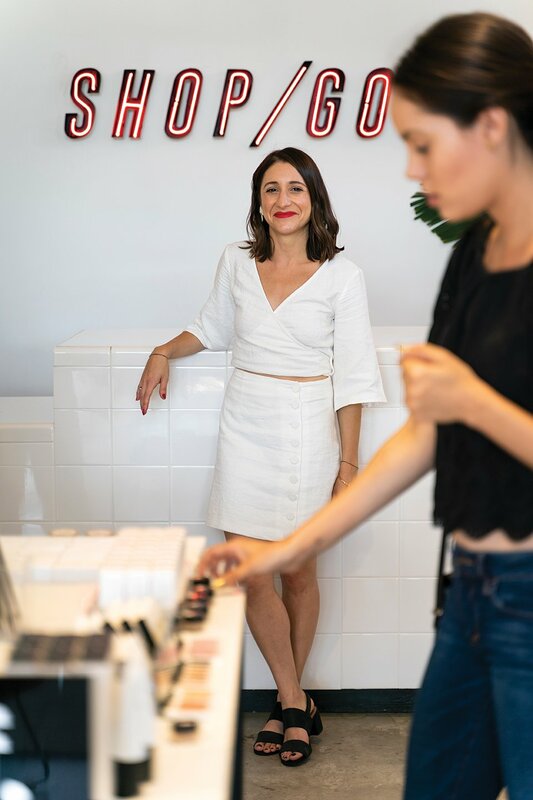 To understand where Shop Good owner Leah Kirpalani likes to go and why, you need a little background info: Leah didn’t always dream of opening her own clean-beauty boutique/spa. (By the way, Leah is opening her second location at One Paseo in Carmel Valley this spring.) After college, she moved to San Francisco to work in corporate retail. But shortly after moving, her health took a dramatic—and unexplained—downturn. “I gained a significant amount of weight, started losing my hair, developed cystic acne, reacted allergically to foods I’d always enjoyed and cried for no reason at all,” she shares. Doctors attributed the sudden changes to stress, but Leah knew it was something else. 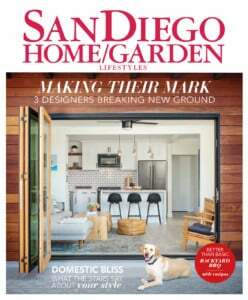 After lots of research, she took matters into her own hands and found comfort in the holistic living community. It’s a lifestyle she lives, makes her livelihood from, preaches and wholeheartedly supports. 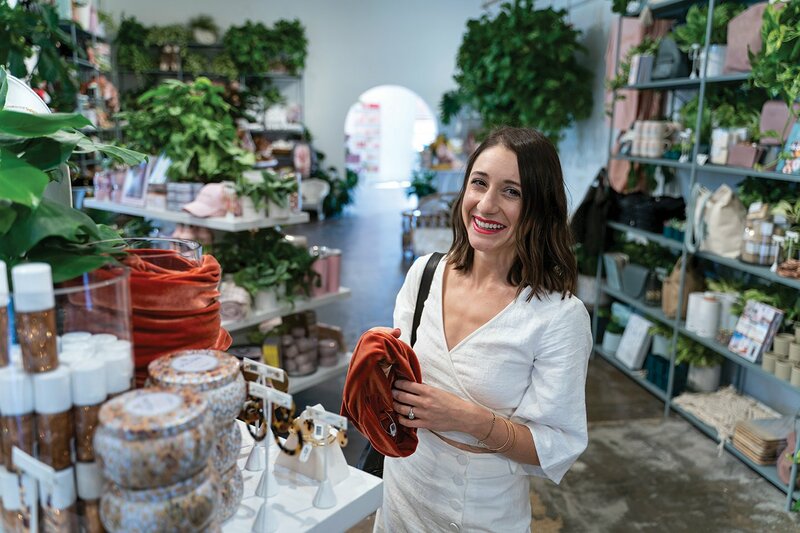 Leah meets us at this boutique within the Moniker General space in Liberty Station (there’s also a location at Flower Hill Promenade and opening at One Paseo). She’s carrying a few outfit options for the shoot—all of them from this bohemian clothing and lifestyle brand. 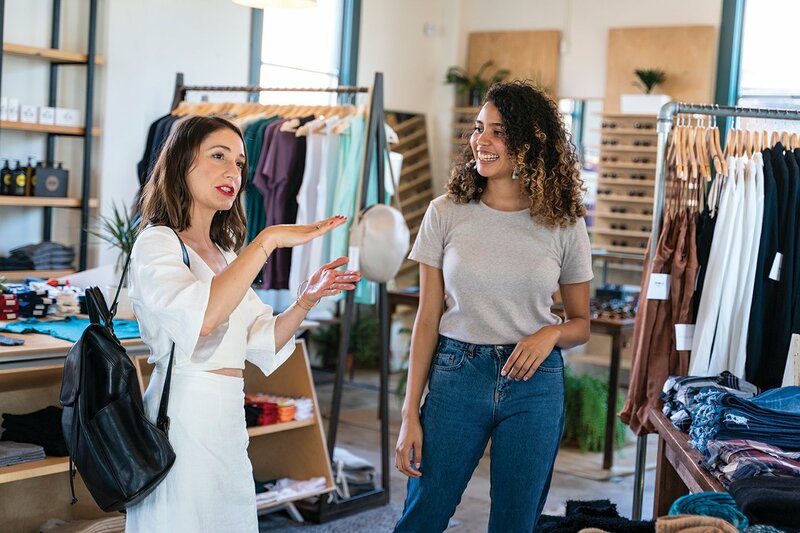 She settles on a linen mini wrap dress from Third Form, changes into it quickly, then saunters through the mixed retail coworking space, picking up cozy sweaters, scented candles and a fabulous black hat. “I lost [my black hat] in the San Francisco airport last season,” she says. But this one’s a bit too big for her petite frame. Aside from shopping and chatting with friend Jazmine Brown (above), the retail lead here (who also happens to be one of Leah’s customers at Shop Good), Leah and her husband Sach come here on weekends to eat and linger. They’ll order an avocado toast and a drink. Her zero-additive pick when she has a cocktail? Del Maguey Mezcal Vida, soda water and lime. 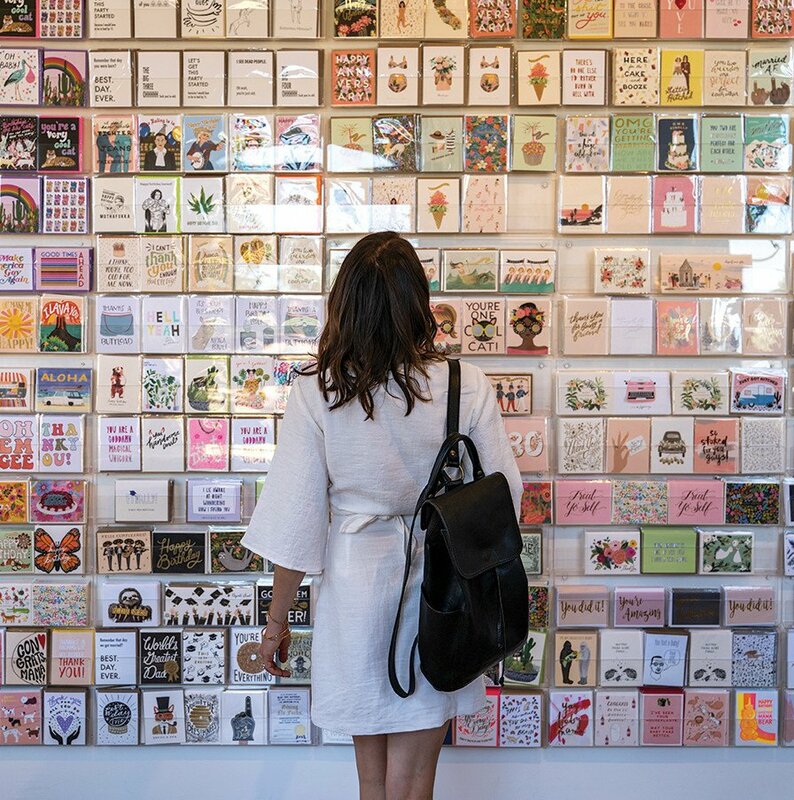 Today, she gets sucked into the fixture of orangey-red fashions, accessories, home goods and gifts, and the wall of cards. 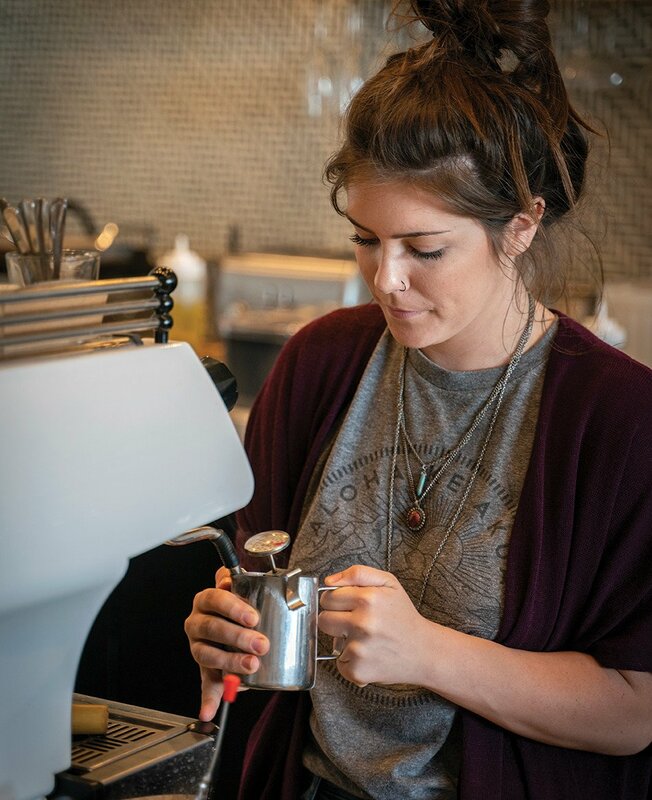 “Before Sach and I moved here, I was a little worried about where I would eat,” Leah admits. 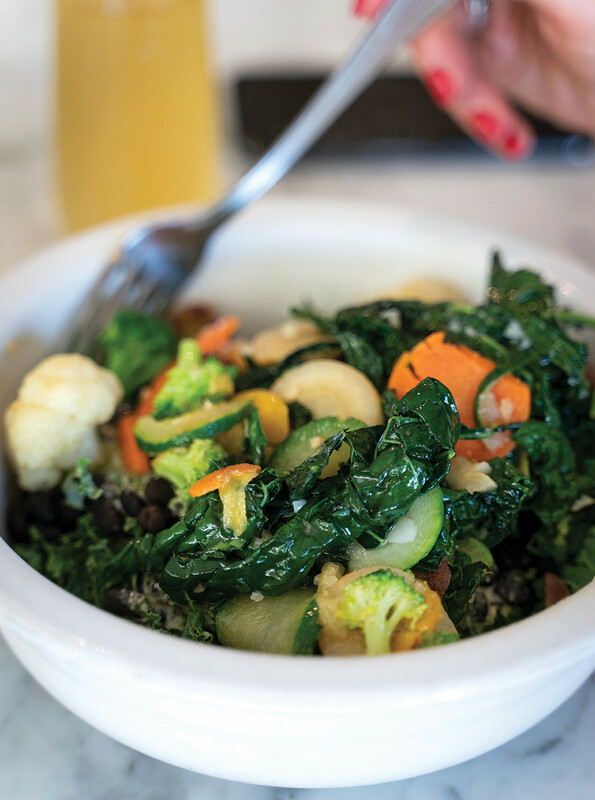 She’d already begun her holistic healing in the Bay Area, and she found several plant-based restaurants she liked, including this now San Francisco-shuttered healthy eatery. Lucky for her, the Little Italy location remains. She’s a creature of habit so she orders her regular lunch: the Grateful bowl with shredded kale, black beans, garlic tahini and a mix of brown rice and quinoa. 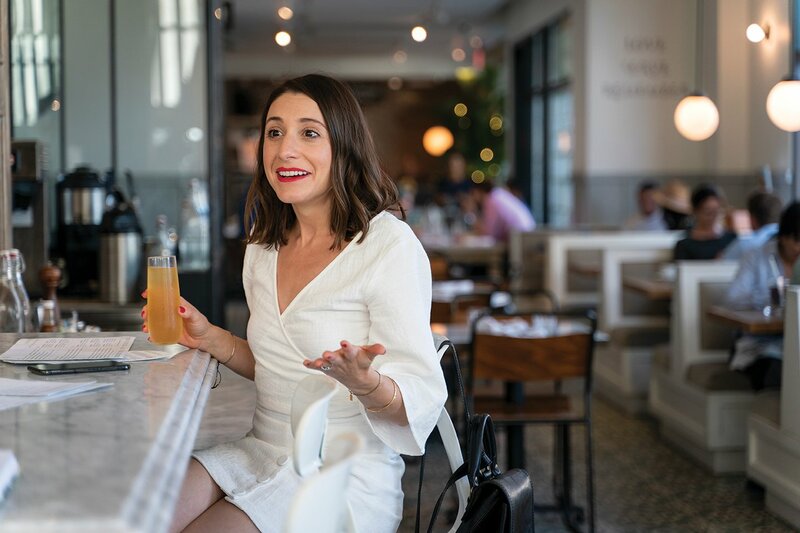 She adds a side of grilled vegetables, which she mixes right in, and sips the ginger kombucha that’s on draft. For dinner, she switches it up and gets the Whole bowl, featuring yams, adzuki beans, sea vegetables, sautéed greens, kim chee, garlic tahini and toasted almonds over brown rice and quinoa. She pairs this with a glass of organic red wine. After lunch, we stop by this North Park coffee shop. 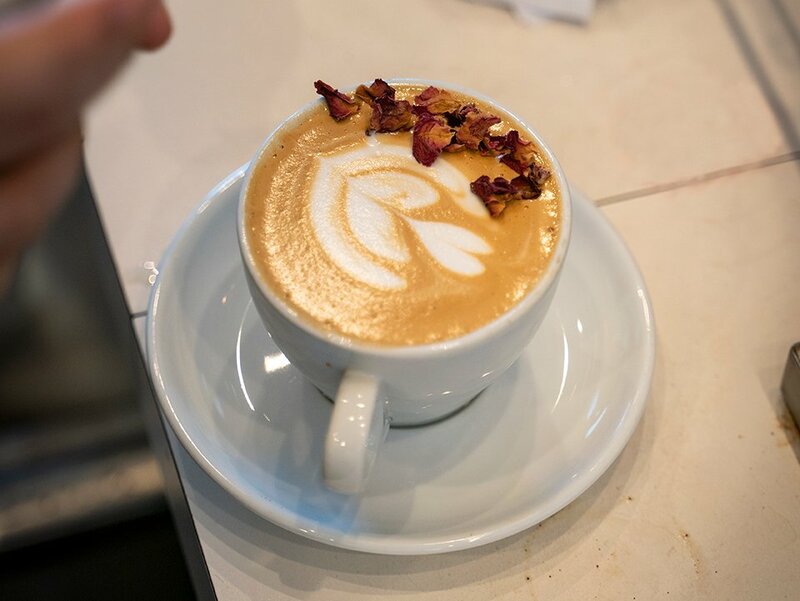 They just launched a cocktail menu, and though the rosé spritzer sounds refreshing on this warm afternoon, Leah opts for a splurge—La Vie En Rose cappuccino—and an iced green tea for the road. It’s nearly time for Leah’s pedicure, so we drive to this hair-and-nail studio off El Cajon Boulevard. “I’m always running a mile a minute,” Leah says. 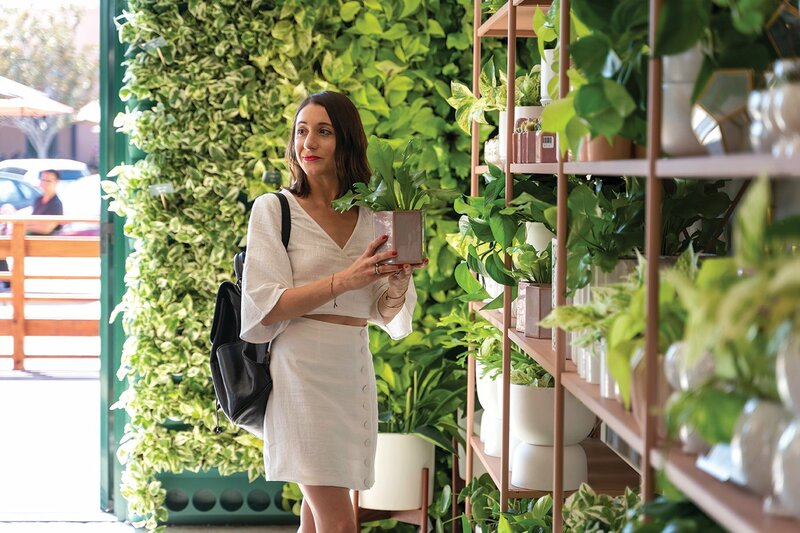 “This is the place I can zone out and practice some self-care.” She’s been coming here for a few years now, ever since she met owner Marchelle McKeirnan at a bone-broth workshop Leah was hosting (before she opened her store and spa). The salon only uses five- or seven-free polishes, meaning the nontoxic formulas lack potentially harmful ingredients like formaldehyde, formaldehyde resin, xylene and more. “They also use coconut oil for the massages, so it’s a totally natural pedicure,” she adds. Next, we walk North Park Way from 30th to Utah streets, perusing locally grown produce, artisan items, prepared foods and other goods. Leah’s shopping for dinner tonight. She stops at one of the tents and fills a bag with multicolored beans and a few tomatoes (the vendor tells her they’re still sweet)—all grown in Oceanside. 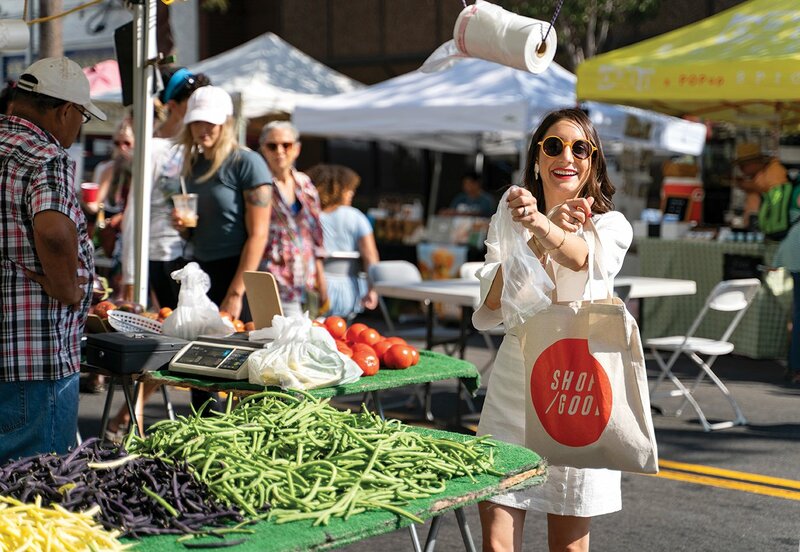 “My husband loves to cook, so I pop over here to get seasonal produce or try different ingredients we haven’t used before,” Leah says.